Replace the wiper blades if they are worn. Lift the wiper arm away from the windshield. Push the release tab B . Move the wiper blade A down and remove. 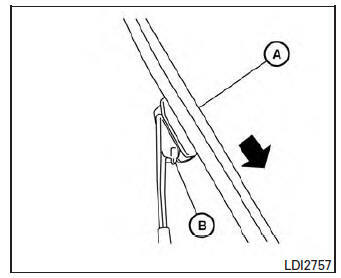 Insert the new wiper blade onto the wiper arm until it clicks into place. Push wiper on to windshield. 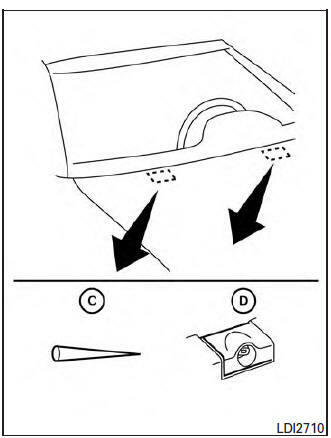 After wiper blade replacement, return the wiper arm to its original position; otherwise it may be damaged when the hood is opened. Make sure the wiper blades contact the glass; otherwise the arms may be damaged from wind pressure. If you wax the surface of the hood, be careful not to let wax get into the washer nozzle D . This may cause clogging or improper windshield-washer operation. If wax gets into the nozzle, remove it with a needle or small pin C .
Contact a NISSAN dealer if checking or replacement is required.